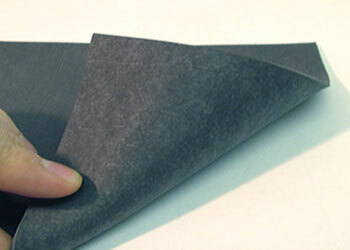 This thin, heavy sound barrier mat is ideal to upgrade the the soundproofing of timber joisted floors and stud walls. 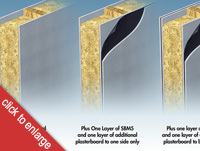 It is a thin, heavy and very flexible sound barrier mat designed to add mass to timber joisted wooden floors and decouple layers of acoustic plasterboard on stud walls. With floors, the more layers that are added the more efficient the sound loss becomes whereas with stud walls, just one layer sandwiched between the plasterboard decouples the mass of the plasterboard therefore, enhancing the soundproofing properties of the wall. Ideal for stud walls dividing bedrooms where space is an issue. SBM5 is a specially developed, heavy mineral loaded acoustic membrane that is easily cut to size and installed by any DIY orientated person or professional installer. At only 2mm thick, this sound barrier mat has excellent sound insulating properties that dramatically improves the soundproofing of lightweight structures such as stud walls and timber floors. Because SBM5 works on the same principle as lead using mass to soundproof against airborne noise it can be used sandwiched between layers of acoustic plasterboard to upgrade the sound insulation of stud walls or laid in layers on floors to add mass. In respect of its use on floors, the more layers that are installed, the more effective the sound loss through the floor becomes. A 3dB reduction in sound is equal to a 50% reduction in the volume of noise using the straight line method of measurement!! 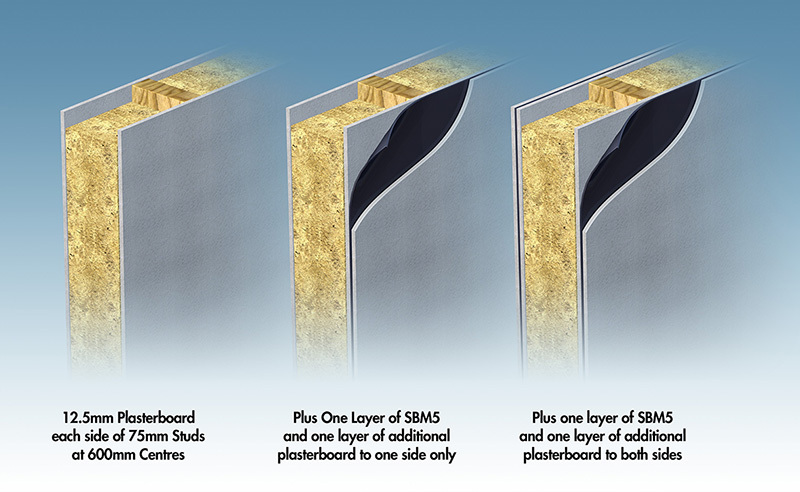 SBM5 also has plasticisers to help bind the product together and so is not suitable for permanent bonding to walls or ceilings although it can be bonded on a temporary basis to stud walls long enough to screw a layer of acoustic plasterboard on top. For best soundproofing results, the product must be sandwiched between layers of high density plasterboard on stud partitions. All floorboards should first be screwed tightly down so they do not squeak. Once complete use our Acoustic Sealant to seal up all the gaps between the floor boards and around the edges where the floor meets the walls. It is most important there are no holes or gaps in the floor that would allow noise leakage. Once the base floor has been suitable prepared, apply the SBm5 in layers with each layer overlapping the gaps of the previous. I the mats are required to be permanently fixed nail or glue them with our Sta-Stuck sprayable adhesive. Remember, the more layers that are installed the better the soundproofing of the floor will become. Once installed, due to the additional mass that has been added to the floor, the airborne insulation of the floor will be improved but the mats are only suitable for reducing airborne noise. If impact noise is also a problem you will have to add an impact absorbing layer or consider using our QuietFloor acoustic underlay instead. SBM5 is heavy and packed in rolls of 3 so help is advised when lifting! SBM5 is produced using recycled materials and because of this, sometimes an odour may be noticeable. ALthough the odour is not harmful, it evident it will be necessary to seal the product with a polythene membrane before covering with other products such as plasterboard or carpet. Polythene can be purchased the same time as the product and is sold in 4m widths by the linear metre.